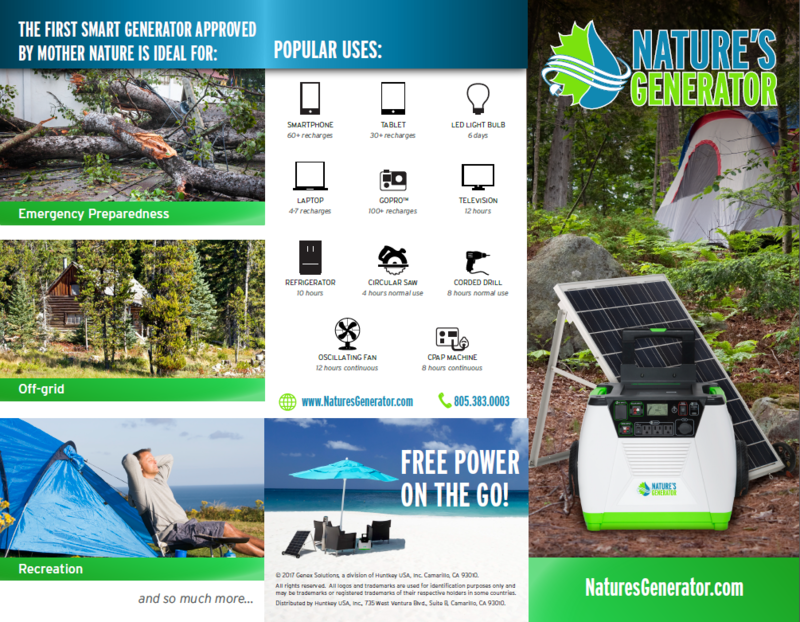 DATELINE: LAS VEGAS, NV JAN. 3, 2018 — Huntkey, a global power solutions provider, announces to release the Nature’s Generator at CES 2018. Designed for emergency preparedness, off-grid situations and recreation, it can charge smart phones, tablets, laptops, led lights, televisions, full-sized refrigerators, power tools and so much more! 1. It has a built-in 1800W pure sine wave inverter and internal 60 AH battery; it helps to produce 720-watt hours of total output on a single charge. 2. The included 100W polycrystalline solar panel(s) with included solar panel cart for ease of transport and movement. 3. It includes three 120V AC outlets, 2 USB ports that produce 3A of combined power, one 12V DC outlet, one solar input (200W charge controller included) and one wind input (300w charge controller included) . 4. Bluetooth SmartKey allows you to track system use and run system diagnostics. Easily pairs with most iOS and Android devices. 5. The built-in 600-Volt/175-amp expansion port for connecting an unlimited amount of Nature’s Power Pods. For more product information, please visit the Huntkey booth at CES located in South Hall 4 of the Las Vegas Convention Center at booth #36160 from January 9-12, 2018.